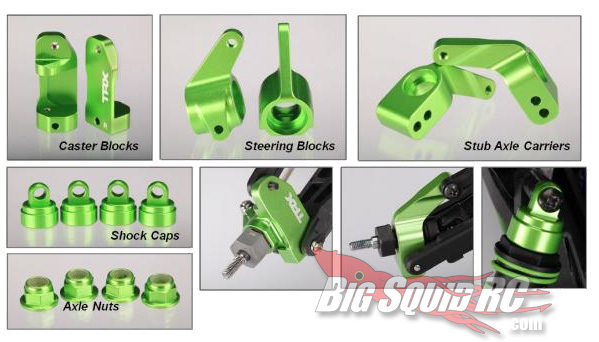 Traxxas Green Aluminum for Grave Digger « Big Squid RC – RC Car and Truck News, Reviews, Videos, and More! Traxxas has just announced some new aluminum hop up parts. These new parts are designed to add a little bling and durability to your Monster Jam Stampede Grave Digger Edition. The green aluminum parts will also fit many other Traxxas models like the Rustler, Stampede, Slash and Bandit. Parts include Caster blocks, Steering blocks, Stub Axle Carriers, Shock Caps and Axle nuts. Looking for even more green? Check out or recent Press from STRC, as they also just released a bunch of Green Aluminum hop-ups.